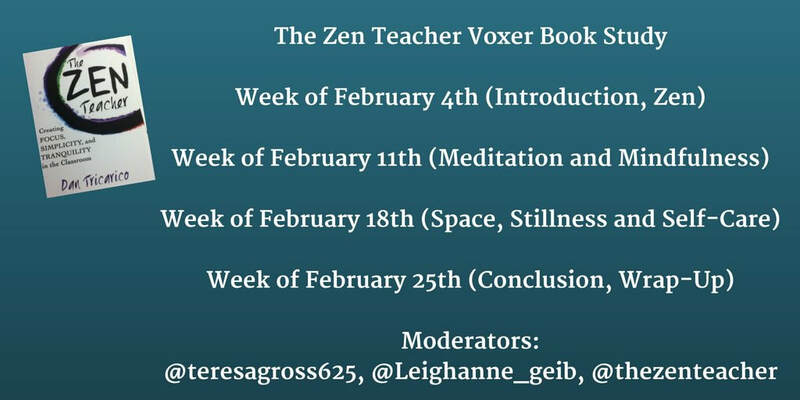 If you would like to join a fun and thought-provoking book study on my book The Zen Teacher: Creating Focus, Simplicity, and Tranquility, please consider joining The Zen Teacher Voxer group that is running a book study beginning this Sunday, February 4th, and continuing through the month of February. The book study is being facilitated by two amazing Zen Teachers, Teresa Gross and Leigh Anne Geib. If you are interested in joining the group, please Tweet one of the facilitators and they will add you to the group. Find Teresa Gross at @teresagross625. The structure of the book study is outlined in the graphic above and is basically divided into the three sections of the book: Zen, Meditation and Mindfulness, and Space, Stillness, and Self-Care. There will be a wrap up week at the end of February, and there is even talk about keeping the group going after the book study so we can continue our talk about self-care and navigating the stressors in the education profession. But if you only want to join for the study, that’s totally cool, too. We have been adding participants to the group for awhile now and as we get to know each other, I can tell you from first hand experience that the members of the group are supportive, helpful, and encouraging. And I know they would all consider you most welcome, if you are interested in joining. Plus, I will be there myself to answer any questions about the book, stress reduction, or intentional and radical self-care. I am also looking forward to learning from all of the other wonderfully skilled, kind, and deeply committed teachers in the group. If finding a way to increase your level of calm, focus, simplicity, and well-being sounds inviting, this book study might be for you.